Two challenging aspects of indoor surfaces we are aiming to probe are organic surface films and modification by deposition. 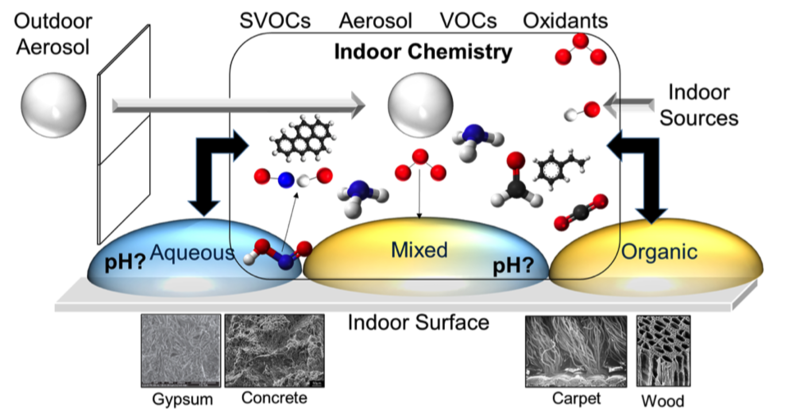 Both have been difficult to quantify, but have potential to improve our understanding of the evolution of surfaces indoors. For organic films or pockets, these are known to form on indoor surfaces, but their properties are not well known, nor is their heterogeneity. Thus, in addition to probing water coverage it is also important to probe the interactions between organics on surfaces and water. The second aspect is the modification of surfaces by the uptake of gases or aerosols. To probe these questions, a combination of methods that span from the macro (millimeter) scale to the micro (Raman microspectroscopy), to the nano scale (atomic force microscopy with photothermal infrared spectroscopy – AFM-IR). Overall, from this grant, an improved understanding of the acidity or basicity of surfaces indoors will be obtained. Our results will provide information on surfaces that will connect with other Sloan measurement and modeling efforts.